the most popular festivals of Hinduism. Spiritually this festival signifies the victory of light over darkness, good over evil. Millions of Hindus around the world celebrate Diwali with gift exchanges, fireworks and festive meals. There are a number of religious significance of this festival. Diwali is celebrated to honor Lord Ramachandra. It is believed that on this day Lord Ramachandra returned to Ayodha after 14 years of exile during which, he fought and won a battle against the demon king of Lanka, Ravana. People lit their houses to celebrate his victory over evil (light over darkness). Also the goddess of happiness and good fortune, Lakshmi figures into the celebration. It is believed that she roams the Earth on this day and enters the house that is pure, clean and bright. The word diwali is derived from dipam (diya) which is known as clay lamp. Diwali is one of the happiest holiday in India. People clean their homes, decorate them for the festivities, buy new clothes for themselves and their families, as well as gifts, appliances, kitchen utensils, even expensive items such as gold jewelry, also buy gifts for family members and friends which typically include sweets, dry fruits etc. Since Diwali is just around the corner, so instead of buying sweets from market for celebration, do give try some at home like pista sandesh, sabudana sitaphal payasam, strawberry sandesh, paneer payasam, masala bhapa doi, sarapuli, papaya halwa, motichoor whipping cream parfait, rasgulla custard pudding, poha ladoo with chocolaty coconut filling, sweet boondi and lots more. This year I have prepared a fruity flavored ladoo. 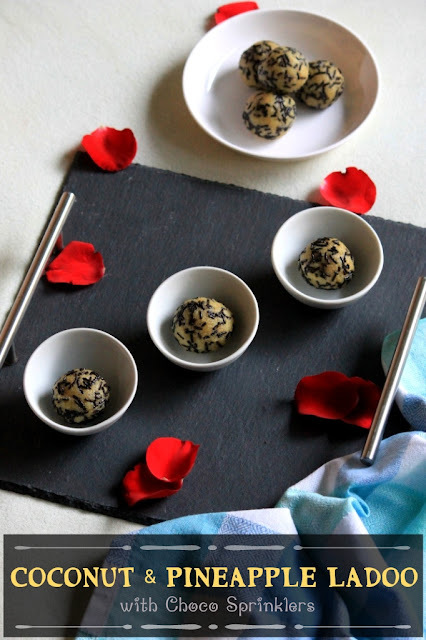 The fresh coconut and pineapple ladoo with chocolate sprinkles is much easy to make and can be prepared within 10 minutes. 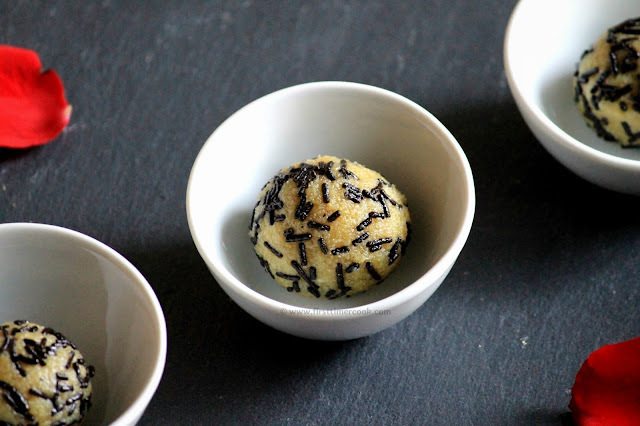 These ladoos will give a unique flavor to your taste buds as well. Fresh pineapples or canned ones can be use for these ladoos. After making the ladoos, I just roll each ladoo with chocolate sprinkles to give some fanciness. Since the healthy and nutritious pineapple is used here, so these ladoos can be a healthy snacks for kids. Also the theme for #114foodiemondaybloghop is decided as 'Diwali Dish', so these fresh coconut and pineapple ladoo with chocolate sprinkles are contribution of mine. Lets get into the recipe in details as mentioned below. Heat ghee in a nonstick pan over medium heat. Add the pineapple pieces and saute for 1-2 minutes. Take out all the pineapple pieces and blend to a smooth and fine pulp type texture. In the same pan, pour the pineapple pulp on low heat. Add grated fresh coconut and sugar. Stir well and cook for 4-5 minutes stirring in between. Next add cardamom powder and milk powder. Quickly stir till everything incorporated well. Cook again stirring in between for 2-3 minutes or until the whole mixture thickens. Transfer the mixture to a plate and allow to cool a bit. Grease both palm with ghee. Scoop out 1-2 tbsp of mixture, roll and shape into ladoo. 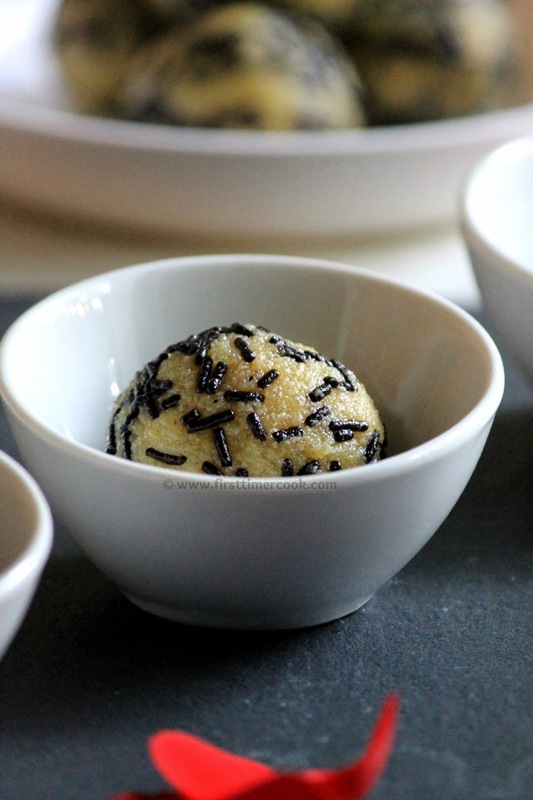 In a plate put some chocolate sprinkles and gently roll the ladoo over sprinkles. Repeat for rest of the mixture and make ladoos. 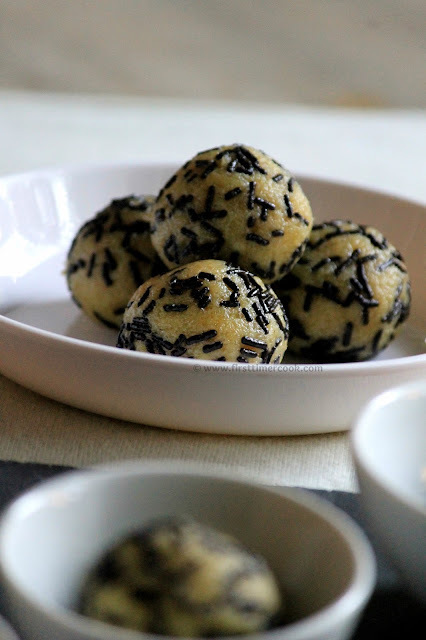 Enjoy these delectable coconut & pineapple ladoo with choco sprinkles right now or refrigerate in an air tight container for later ! Here the binding agent is the milk powder. So if the mixture is not getting thick easily, then add some more milk powder (1-2 tbsp). These ladoos can be stored up to 2-3 days. These are simple everyday ingredients transformed by magic into a delicious laddu! Loved it, Sasmita. Happy Diwali. 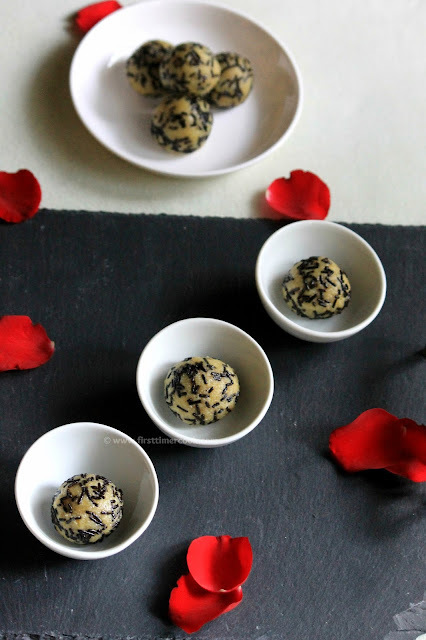 Pineapple ladoos sound so innovative Sasmita.. beautiful share ! These look adorable! And I am in love with the little bowls that you have them in. Great photos and recipe! I learned a lot from your post, very informative! These are very interesting and I think I may give them a go! Pineapple and coconut together. You can't go wrong. Wow coconut and pineapple is a great combo. Innovative and simply awesome idea. Loved the pictures. Lovely!! !This diwali theme is bringing out so many innovative recipes. Lovely share! Amazing share Sasmita.Perfect for this Diwali!! 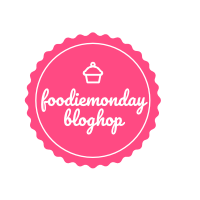 A fruity ladoo, that's an innovative recipe Sasmita. Great share for Diwali. 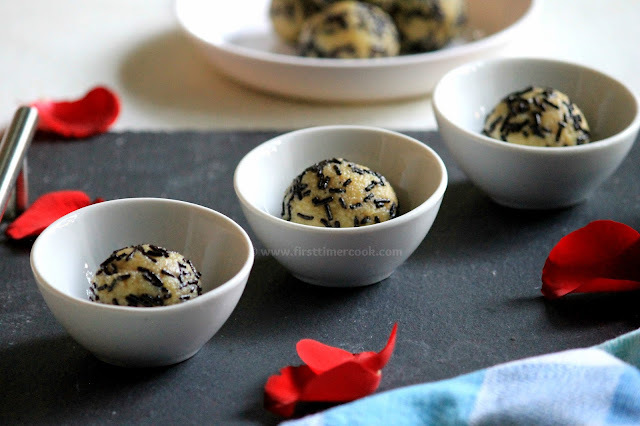 Pineapple and coconut; amazing tropical flavors in a ladoo!! Brilliant and looks super tempting too :) Thanks for sharing! A very unique combination and looks super delicious! Wow pineapple in a ladoo. thats a first for me. Lovely recipe. These fruity ladoo sounds delicious.